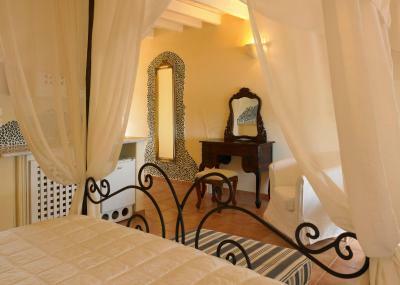 Lock in a great price for Suites of the Gods Cave Spa – rated 8 by recent guests! The pool is UNBELIEVABLE! The views and service at the pool were out of this World! The hotel is heaven on earth, it was like love at first sight the minute we walked from reception to our suite. The Suites of the Gods honestly has the most incredible views from all over the hotel, with the most magical view I have ever woken up to. 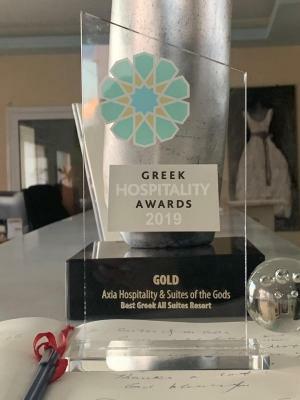 Amazing staff that are extremely attentative, nothing was too much trouble our two favourites were Ilias at reception and the lady at breakfast. 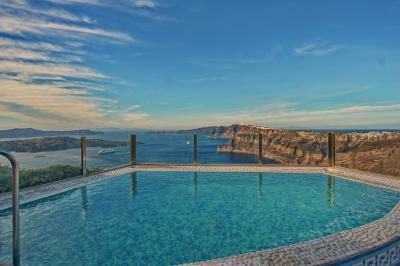 The perfect location to explore the island or relax by the our of this world infinity pool overlooking the Caldera. Breathtaking view. We have never felt so relaxed during a holiday, and cannot fault the hotel and team at all. Thank you so much for all the memorable moments we cannot wait to return and have already booked for August. An island and hotel that everyone must visit at least once in their life. The staff, location and view were excellent. Could not fault the friendly team. Reastuaeant food was outstanding too. The straff are very helpful and service minded. The view from the hotel is spectacular. The bed is extra comfortable. The breakfast is very good, the service is just great. Very good hospitality! Room was a bit out-dated but view was amazing from outside the hotel. We didn’t have hot water for more than few minutes so got upgraded to nicer room. Suites of the Gods Cave Spa This rating is a reflection of how the property compares to the industry standard when it comes to price, facilities and services available. It's based on a self-evaluation by the property. Use this rating to help choose your stay! 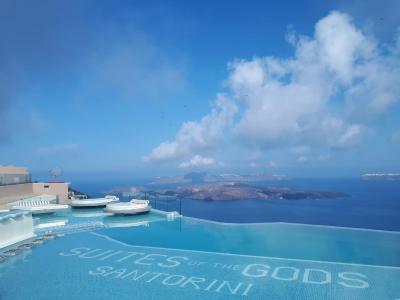 Featuring breathtaking views of the caldera, volcano and Santorini, this luxurious boutique hotel offers exclusive spa facilities with complimentary à la carte breakfast, free internet access and free parking. 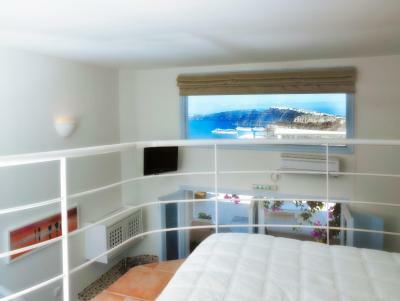 You can enjoy absolutely stunning views of the caldera and the islands from their beautifully appointed rooms. 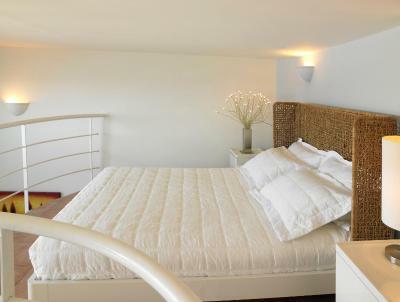 Each suite is individually decorated and tastefully designed for comfort and pleasure. An à la carte breakfast is served to guests in their room, on their terrace or in the restaurant. With service until 10:30, guests of Suites of the Gods can take all the time they need to start their day. 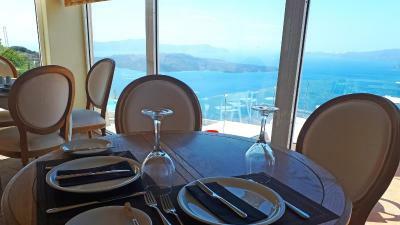 The hotel also has a bar and restaurant overlooking the Caldera and the volcano - a fantastic range of Mediterranean cuisine is on offer. Suite of the Gods also offers the beautiful Cave Spa. 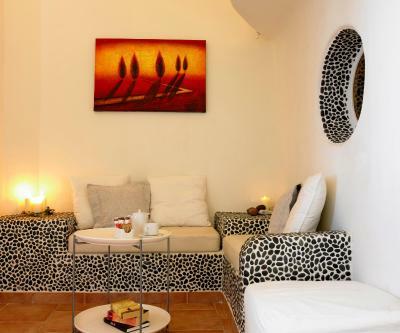 These cave rooms have been fully renovated to create an intimate and relaxing space for guests to enjoy health and beauty treatments. Afterwards, guests can enjoy further relaxation in the sauna or in the Turkish steam bath. 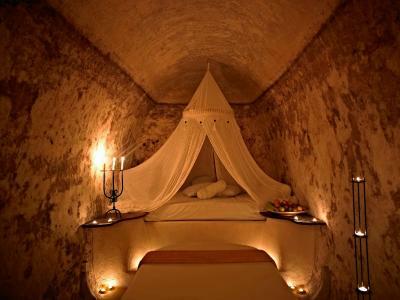 When would you like to stay at Suites of the Gods Cave Spa? The suite consists of of an open-plan bedroom and sitting area.The bedroom is also appointed with a bath tub overlooking the volcano. There is also a private bathroom with a shower. The private veranda offers Caldera and sea view. 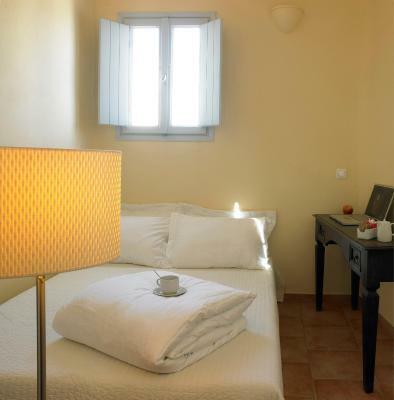 The spacious bedroom is appointed with a bathtub overlooking the caldera. It also features a luxurious sitting area and a private bathroom. The spacious veranda offers Caldera and sea view. The Master Suite includes an à la carte breakfast served in your room, in the swimming pool area or in the restaurant. 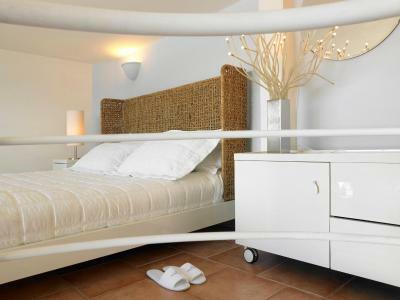 Fitted with Trussardi amenities and Guy Laroche sheets, this suite consists of of a spacious bedroom with a bathtub overlooking the caldera, and a spacious living area. There is also bathroom with a shower. 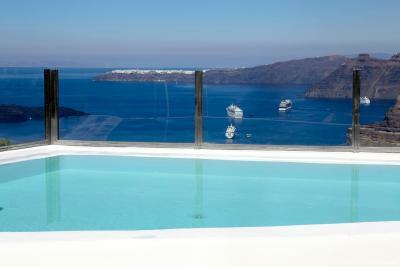 Opening to a balcony, it features a private pool with sun loungers overlooking the Caldera volcano. This split-level suite consists of of a seating area, loft bedroom and bathroom with a bathtub and shower. 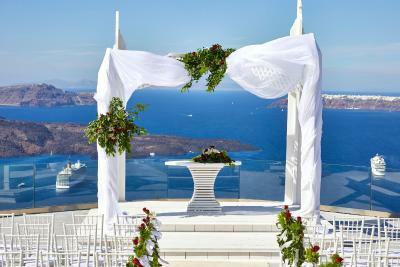 The private veranda offers views of the Caldera and the sea. This suite has a balcony with Caldera and sea view, and a hot tub. Consists of a master bedroom with a queen-size bed and a heart-shape window, separate living room with a large corner sofa with the option of turning it into an extra queen-size bed, built-in bathtub with volcanic elements and bathroom with shower. 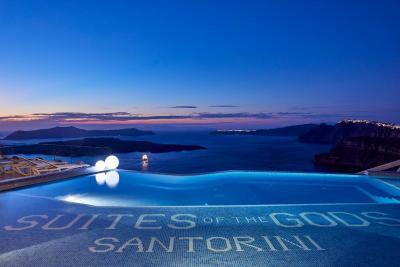 Features private terrace with a breathtaking view of the Caldera and the Aegean Sea. House Rules Suites of the Gods Cave Spa takes special requests – add in the next step! Suites of the Gods Cave Spa accepts these cards and reserves the right to temporarily hold an amount prior to arrival. The view, food, hospitality, clean room!!! Somehow I feel that the facility could be better taking care of. New paint could help. Hot water didnt work in the first room, got cold instantly. No wine glasses or normal kitchenette in room. We got them by asking. No coffee untensils before asking. Breakfast was advertised to have an option to have it in room or terrace but only got it in the first morning, otherwise had it at restaurant buffet. Unfortunately the hotel has a few major issues to sort. They allow day trippers to use the pool and bar which means a lot of the time its crowded with selfie loving tourists that overwhelm the serenity of the view. It is also used for numerous weddings, one of which had a reception that ran until midnight and was so loud it sounded like it was inside our room. Some of the staff were also short, uninformed and at times a little rude. The property desperately needs a renovation. The plumbing in our suite was rusty and would back up into the shower and all over the bathroom floor. The towels, linens, comforters, and bath mats are thread-bare and need to be replaced. In-room safes are from the 1970's and are very temperamental. Also, we were told that since we were in a Junior Suite, we would get a special sauna experience in the spa but they said it was a mistake and we were not granted access. The exercise facility was also out of order during our stay. I stayed in the hotel in Aug (for a weddeding anniversary) I booked a presidential suite with a private pool (it was not a pool, but more a big plunge). My wife noticed an odor coming from the bathroom, first night she couldn't stay in the room and slept outside. The hotel tried to fix the problem and on the second night after coming back from a romantic dinner, the situation was worse, we ended up sleeping outside on our wedding anniversary!, we could not sleep inside from the odor. on the 3rd day we were moved to a smaller suite without a pool (cave type). We did not take the room until almost 3 PM. It was noisy, the bar was above us and you can hear the people echo in the hallway. Something we discovered after we come back at night) . Upon checking out, the hotel did not adjust the price difference and no one in the front desk could do anything. I contacted the hotel manager from the airport and he promised to respond with an e-mail. I got the e-mail and I was dispointed from the response (They claim I was happy in second suite and since I didn't wanted to move to another suite they offered while I was staying they assumed I was fine with the smaller suite, which was true. But i was in Santorini for only 5 nights. My wife and I did not want to spend our holiday moving from one room to another. Any way, I responded back and I was promised a response from the GM this time which came about a week later after a few follow ups. 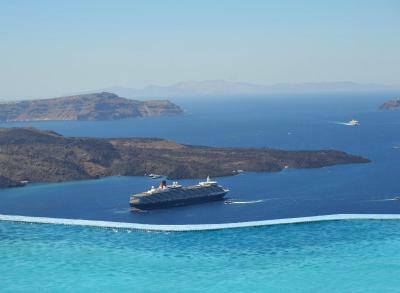 ( He was on a bussiness trip) He offer to keep the difference as a balance for my next stay in Santorini on (2019 or 2020). I responded back that I had no plan to visit again and I requested that the difference in credited into my credit card. After 14 e-mails and follow up and almost a month of follow up no response from the the hotel management and no refund of the difference which was almost 1000 Euro. We had a great welcome. Dora showed us the entire structure and all the services. The spa is lovely and had a nice history. The position of the hotel is just marvelous. Great view on the caldera. The pool might be a little to loud but it is normal because the clients are mostly young people. Room service is very quick and the food in average. Maybe they should renovate some parts but in general it is a good choice for Santorini standards. We stayed in this hotel only one night (Thank God) and we got an old room for a price 224.37 Euros (named “junior suite”). The mattress on the bed was very soft and uncomfortable. In front of our room was water on the floor from A/C. It was very dangerous, because we slide all the time. The room smelled horrible and the worst just came. We had cockroaches and a mouse as not told friends. We could not sleep all night, because the mouse was moving all the time. Besides, she made noises when she had eaten something. The next day we spoked to the manager about it. He called his boss who was extremely aggressive and said that it was our fault that mouse entered the room. Moreover, he said that he don`t believe us. We could not handle this anymore and we decided to leave the hotel (we did not receive a receipt). He started to threaten us, saying that he knew our address in Germany and we should be careful, which opinion we were going to write for this hotel. He also took facial pictures of us to intimidate us. The infinity pool is OK, however every person from outside is allowed to come in. There are no showers next to swimming pool what can be problematic speaking about personal hygienic. As a result, the water is dirty. A toilet is about 40 meters from the pool. As a hotel guest, you will not get a beach chair (a deck chair) near the pool, because all beach chairs (deck chairs) were reserved for external guests. Finally, you do not need to book the hotel, to go to the pool. At the bar we had a few cocktails and paid 66 Euros. We found it quite expensive. If you are coming to this hotel with a car, pay attention regarding the "parking place". This hotel don't have any parking and you have to give the car-key to the reception. They move cars, if somebody wants to go to the city, because you stay in a very small tight street. IMO it is dangerous, because your car can be scratched. This is the worst hotel we have had so far.